Discussion in 'Lexus Lounge' started by krew, Jun 4, 2018. Most fuel efficient non-plugin luxury vehicle in North America. Den and isanatori like this. No offense intended to anyone, I have seen many times on several websites - plug in pro journalists are using this definition too- the term "non plug in hybrid". Hybrid is a car with a combustion engine and an electric motor, each of which/or both of them can propel it. I think the ES300h is a hybrid car. Maybe we could be using the term self-recharged to highlight the type of hybrid. Thank you for your kindness and empathy. F1 Silver Arrows, Joe, TheNerdyPotato and 4 others like this. When talking about fuel consumption, it is important to note that it is non-plugin, so it does not have pre-charged storage of energy that gives it 25-50 miles of range for 0 consumption that skews with the MPG data. TheNerdyPotato, LDeleuran, Joaquin Ruhi and 3 others like this. Lexus uses the term "self-charging", but that seems awkward and unclear to me. Non-plug-in was the only thing I could think of. Joe, RAL and isanatori like this. My bad. You are correct. Plug-in prius is self charging too. Not on topic, but I would like to commend the humility and respect demonstrated in the sharing of conflicting opinions in this thread. I think it is admirable and exemplary ... something I appreciate about our LE members. But when I don't find this level of civil discourse on the part of some commenters, I just choose to ignore ... especially in the case of an obvious troll. Giving a troll any acknowledgment only feeds a narcissistic need for attention. F1 Silver Arrows, mikeavelli, ssun30 and 1 other person like this. Surely cars are petrol, diesel, hybrid or electric? Where does plug-in fit in to the scheme of things? I actually like "self-charging", especially as an explanation to the public. It both describes how it works and it's a handy marketing club against cars requiring 1-hour stops at charging stations. Joe and Joaquin Ruhi like this. 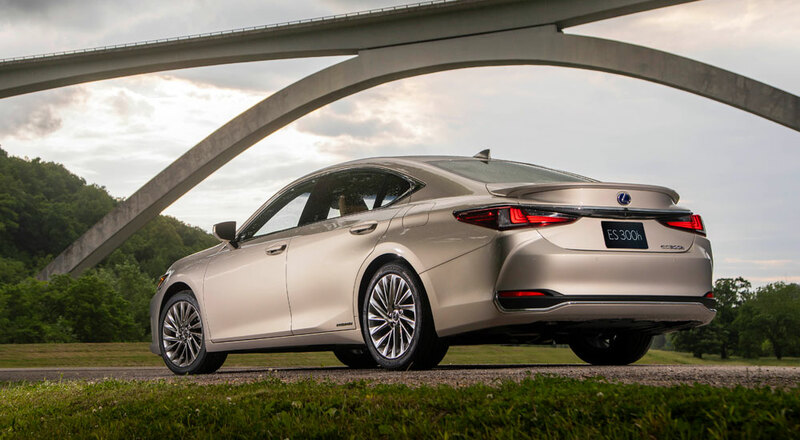 At 44mpg the ES300's fuel economy is identical to that of the Avalon Hybrid XLE, which comes with 17" wheels, but with 18" wheels, the Avalon Hybrid XSE gets just 43mpg, so I'm pretty sure the quoted 44mpg is from the standard ES300h with 17" wheels and not the one pictured in the post, with upgraded 18" wheels. Most plug-ins can self-recharge as well, although at abysmal efficiency. But anyway the term is used very successfully by Toyota, Lexus, and Honda in China. krew and Joaquin Ruhi like this. yeah, i think it is good note it is not plugin... with plugins they calculate range into official MPG, so it gets 100 MPG even if after depletes that energy, German plugins do 20-22 MPG, which is terrible. Of course, all the manufacturers do the MPG testing on barebones models including EVs like Tesla with ECO mode on. Wheels, transmission and equipment weight play the big role in car's efficiency and performance. ES300h is not a quick vehicle so 44mpg is quite reasonable. Lighter IS300h takes 8 seconds in real life to hit 60mph and ES with some aggressive gearing can achieve the same. That is just amazing with the power bump as well. TMC usually reports different MPG for different models, so you can see the difference... EPA also allows manufacturers to report MPG for the model thats going to be sold >60% so many manufacturers use that to show single MPG number.